Okra. It’s one of those vegetables you either love or hate. If you’re one of those people that don’t like them, it’s because of some bad experience eating or cooking it. And usually it all boils down to the texture of okra… it’s slimy! I used to be one of those people who hated okra growing up. 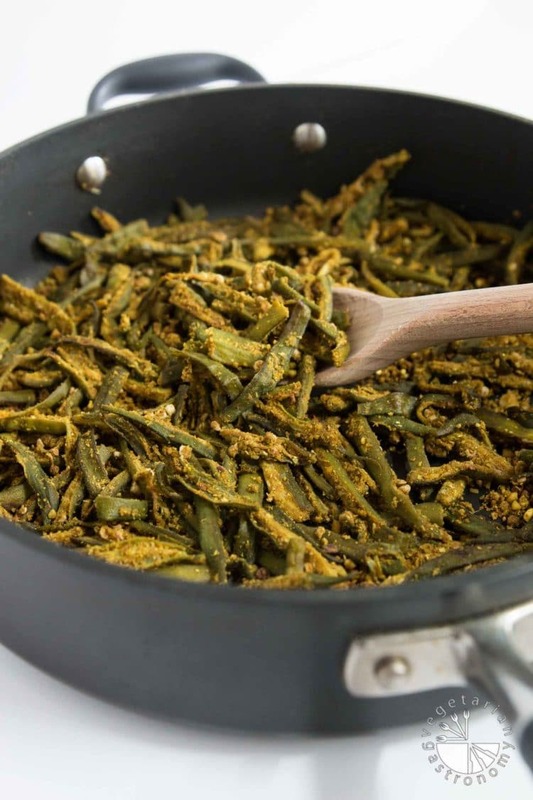 My mom would always cook her Indian okra recipe as a vegetable dish for dinner, and I would always run the other way because of the slimy texture. Well all that changed over the past 10 years when we figured out a healthy and easy way to keep the slime out, and what do you know…now I’m officially a lover of OKRA! 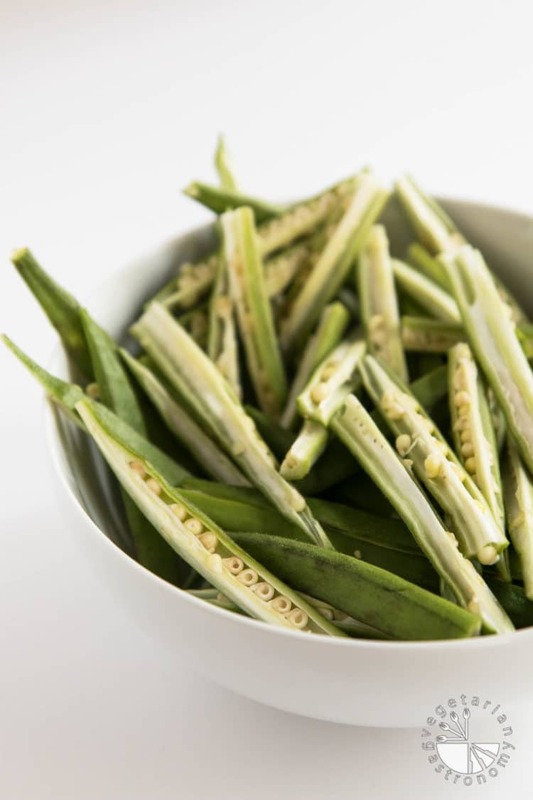 Avoid slicing the okra into tiny rounds, and instead cook them whole or slice them once lengthwise down the center to keep the surface area of the inside to a minimum when cooking. Salt adds to the moisture, so season with salt towards the end of cooking. Steam while cooking the okra produces moisture. Cook on higher heat and use a large pan to avoid over-crowding the pan. See? Easy, right?! 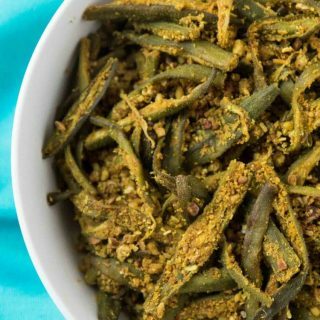 Once you cook the okra, all you need is my dry Easy Indian Spice Blend I posted a few weeks back. If you haven’t tried making this blend before, it’s amazing! It’s a savory dry mix of chickpea flour, ground peanuts, coconut, and some of my favorite Indian spices. It’s perfect to have on-hand and an easy way to jazz up any vegetable dish. I used to make enough of the blend to last me about a month, but after finding these great Infinity Jars, I’ve been able to make larger batches and store them without having to worry about the flavor and freshness of the blend degrading over time! The ultraviolet light filtering material and air tight seal of these jars block out visible light that degrades organic goods. 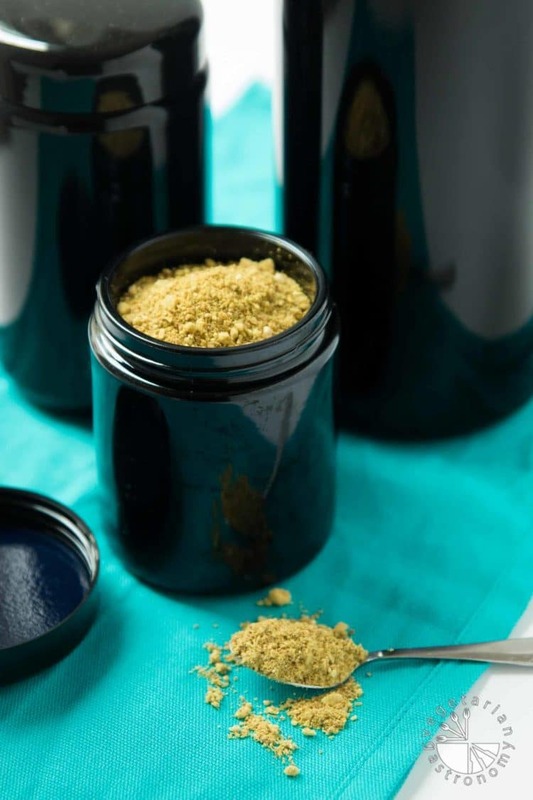 The result is that they enhance the flavor and keep goods fresh for an extremely long time, making them ideal for all my favorite spices that I can’t live without! Infinity Jars carry various screw-top jars, cosmetic jars and bottles, apothecary jars, and large bottles. 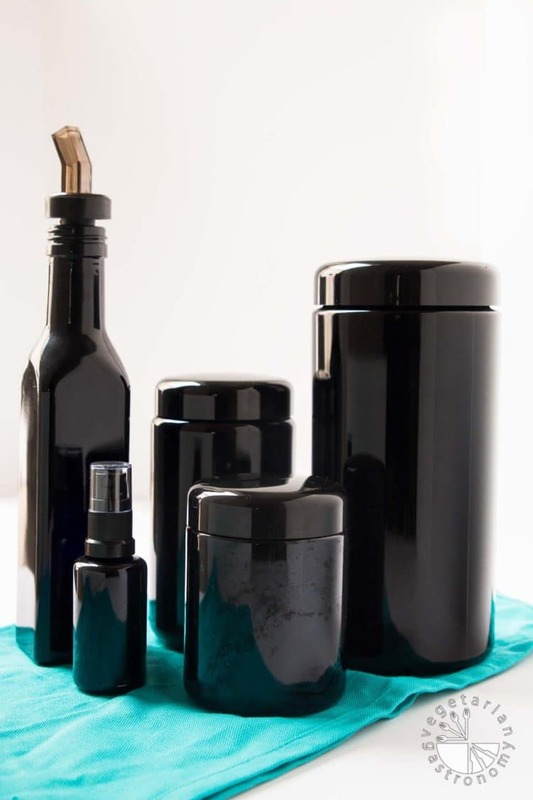 They’re perfect for storing cooking ingredients, dried herbs, tea, coffee, cosmetics, nuts, oils, etc. One of my other favorites is their glass fine mist spray bottle for my perfume while traveling. It preserves the scent and most importantly, keeps the perfume from evaporating. They make perfect gifts for the holidays and add a nice sleek look to your bathroom or kitchen counter. Have I made you an okra lover yet? 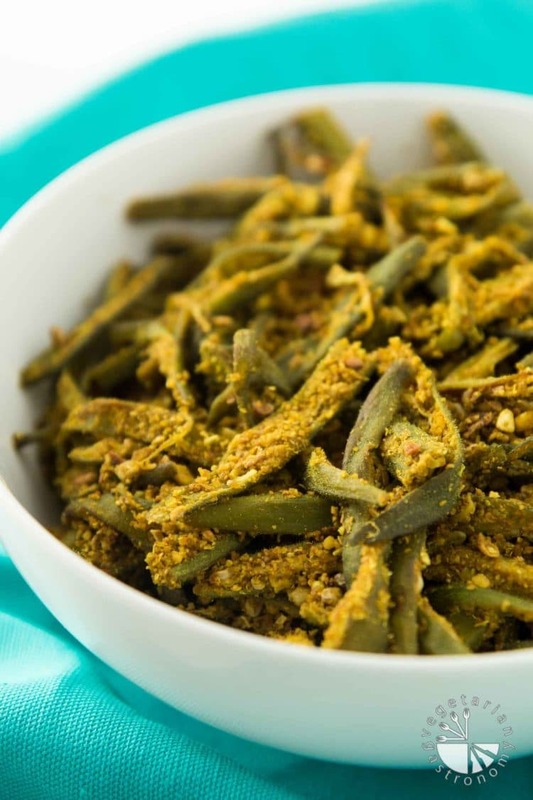 If not, just try out this Easy Curried Okra recipe and I promise you’ll see okra in a new way. 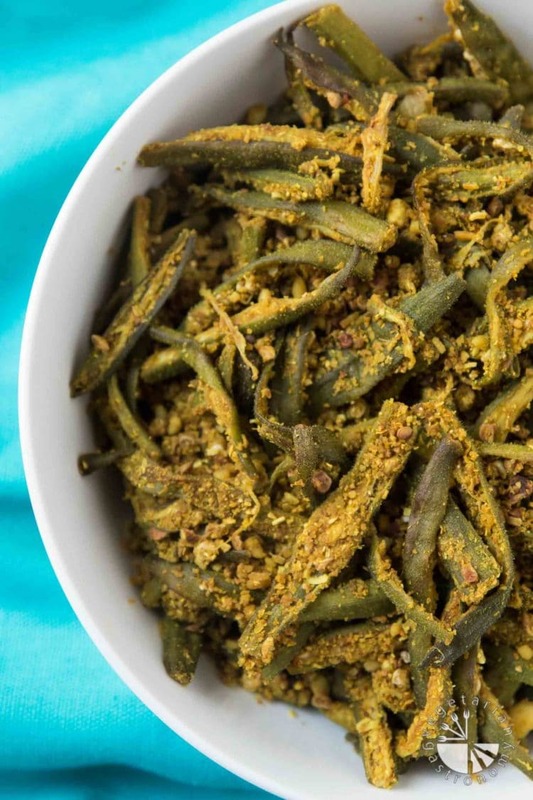 It’s as simple as cooking the okra and sprinkling on my Easy Indian Spice Blend, and that’s it! You’ll have yourself a fun, delicious, new healthy vegetable dish for your family. My kids love it, and it makes a great finger food for the little ones. My 4 year old even took leftovers for school lunch the following day! I’d love to know if I made an okra lover out of you with this dish. Tag me on Instagram or Facebook, #vegetariangastronomy @vegetariangastronomy or let me know what you think in the comments below! This post was sponsored by Infinity Jars, but the opinions and text are fully my own. My mom used to do rounds growing up as well, but now I think she knows i'm not huge on the moisture so she started slicing the other way =) Fresh roti and okra! I'm so IN! Haha they do look like green beans when cut that way =) I'd love to try out your moms recipe! And yes, moms are THE BEST! O that sounds fabulous! What a great way to serve okra! Okra lover right here! This sounds amazing! Can't wait to try it. Great Linda!! Then you'll love this recipe I'm sure of it! My husband loves okra! I can't wait to try it. Awesome, then you're okra experts already! Great tips for dealing with the dreaded okra slime! Thanks! I love okra! The last recipe I tried was a little too oily for my taste.. this looks less greasy! I'll have to try it! I like okra and even enjoy it's moisture. It tricks my taste buds into thinking they are eating something starchy. Going to try your blend out. Oh nice...yeah my brother always loved it too growing up with the moisture, but i just couldn't do it haha =) Well try this new combo with my blend! Okay, I definitely need to try this, because I am not yet an okra lover! 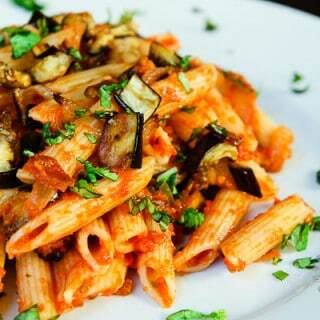 But I want to love any and all veggies, so I am always trying new dishes hoping to be persuaded! Yes! 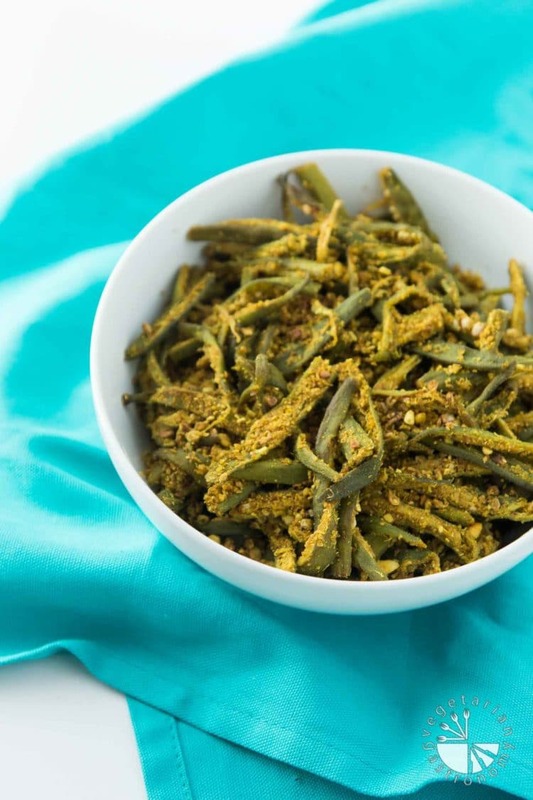 This recipe will definitely make an okra lover out of you! It's all about getting rid of the slime...i used to hate okra also until i figured out how best to cook it! YES! This is the perfect first recipe to get you started since I talk about how best to cook it! And you can really season it with anything, although I'm a huge fan of my easy Indian Spice blend! I learned something new about cooking okra! Thank you for the great information! Thanks Amy!! Hope you get a chance to try them out sometime! They're one of those veggies most people don't know what to do with haha! I was just spying some okra at the farmer's market and wondering what to do with it. Problem solved! YES! You will love this recipe...okra is delicious and really easy to make when cooked properly! Let me know if you try it out! I love Okra! 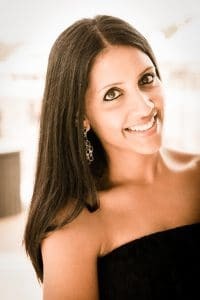 My daughter is actually big fan of this veggie, next time I will try your recipe Anjali:) Tahnks! That's great that your daughter loves okra! You must be cooking it right =) Mine loves picking at these with her fingers! Let me know if you try it out! 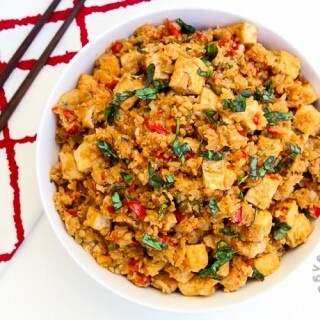 Nice vegan recipe . i love it!! Love okra any way! The curry powder seems great to have on hand.